The Year-End Procedure application is performed at the end of your accounting year. This program rolls the Accounting Period dates forward to those of the current year. Do not do this manually. The program allows users to continue into the next fiscal year without having to close the prior fiscal year. Comparative figures will not be updated by a temporary year end close, therefore comparative figures for the new fiscal year will be two fiscal years old until a final year end close is performed. The Temporary Year-End procedure should be run only once per year as a preliminary step before the final step of your final year‑end closing procedure. Before this program is run, all closing financial statements should be run (including a year‑end Trial Balance). It would be a good idea to back‑up the General Ledger files before running this program. The back‑up media can then be stored as a perma­nent record of the fiscal year's activity. 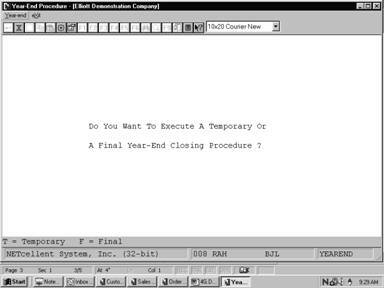 When the Temporary Year‑End Procedure is run, the program flags the G/L period that a year‑end procedure has been run. This will cause all prior year transactions not to be included in the new fiscal year financial statement reports. NOTE: Transactions dated after the fiscal year ending date are unaffected by this processing. However the Trial Balance report will reflect last year’s transactions until the final year-end process is run. The program then advances each period in the Period file by one year. After the Temporary Year-End Procedure is run do not make final adjustments to your retained earnings (capital) account. This will be handled automatically during the Final Year-End Procedure. We suggest that you also verify that the G/L Setup has the correct retained earnings (capital) account entered. General Ledger transactions are not deleted by running a Temporary Year‑End Close Procedure. NOTE: If you have answered the allow temporary year-end closing question in G/L Setup as N, the temporary year-end procedure is not allowed. The Year-End Procedure application is performed at the end of your accounting year. This program rolls the Accounting Period dates forward to those of the current year if a temporary year‑end close was not run. Do not do this manually. The program will also clear the General Ledger Transaction file creating balance‑forward transactions for Balance Sheet accounts and update the comparative file to represent activity for the year being closed. All Revenue and Expense accounts will be cleared of General Ledger transactions. This procedure should be run only once per year as the final step of your year‑end closing procedure. 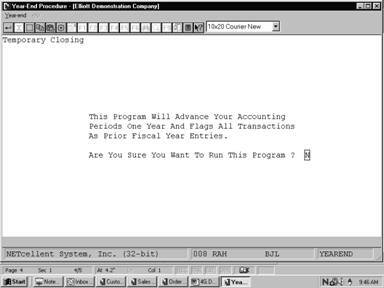 Before this program is performed, all closing financial statements should be run (including a year‑end Trial Balance). Run the Year‑End Procedure. The program will first transfer year‑to‑date figures to the Comparative file. All activity in the year's first fiscal period is consolidated into the first comparative field's amount; the activity from the second period is consolidated into the second comparative field's amount, etc. 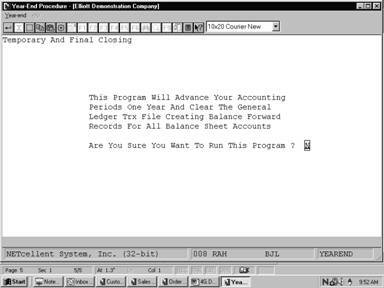 Next, the program consolidates the activity for each Balance Sheet account into a single balance‑forward amount, sets the source field to BBF (beginning balance brought forward), and sets all Revenue and Expense accounts (P&L accounts) to zero, deleting all other activity in the file for the year being closed. NOTE: Transactions dated after the fiscal year ending date are unaffected by this processing. The program then advances each period in the Period file by one year unless a temporary year‑end was already run. In G/L Setup, if the retained earnings (capital) account has been entered and the Create Retained Earnings Transaction In The Gen-Jnl-Trx File At Year End? flag is set to Y, your net income is automatically entered in the General Journal Transaction file. You should print an Edit List and adjust this entry if necessary before you post to the General Ledger. If the Create Retained Earnings Transaction setup flag is set to N, you should manually create the one-sided entry to retained earnings. NOTE: If net income (loss) was closed during the temporary year‑end closing procedure by your manual journal entry then do not close net income (loss) again in the final year‑end closing procedure unless there were adjustments made to the prior fiscal year after the temporary close was performed. * Run a Profit and Loss Statement for the year in order to acquire a final Net Income figure. * Select either T to run a temporary or F for a final year-end closing procedure. To terminate the program without processing, press the ESC or F10 key while positioned for entry of closing procedure type. Do You Want To Execute A Temporary Or Final Year-End Closing Procedure ? T or F. Enter T to perform a temporary or F to delineate a final year-end closing procedure.